From State Route 16, exit at SR 79 North (Cedar Street). The Church of God at God's Acres is approximately 1.5 miles north of expressway. Visiting for the first time ... what can you expect? 1. I'm handicapped; will I have to walk a long way? We have two covered entrances and three large parking lots, with plenty of handicapped parking spaces. During our summer camp meetings, golf carts are also available for quick access to all areas of the grounds. Wheelchairs and handicap restroom facilities are also available. 2) Are your doors locked during the worship service? Yes, once the service starts, all doors are locked and guarded by a member of our security team. 3) Does my child stay with me during the service? Yes. We do offer two quiet nursery areas (one for men, one for women) for parents of small children to use. Both nurseries are equipped with visual and audio access so parents can still enjoy the service while caring for their little ones. Our children's services include Sunday school for all ages at 9:30 am and story hour/junior church at 5:00 pm each Sunday, prior to the evening service. 4) What are your worship services like? Our worship style is definitely not contemporary and would probably best be described as traditional and conservative. Our services include inspirational, Spirit-led singing and old-fashioned holiness preaching. The ushers do not hand out programs, and sermons are not announced ahead of time. 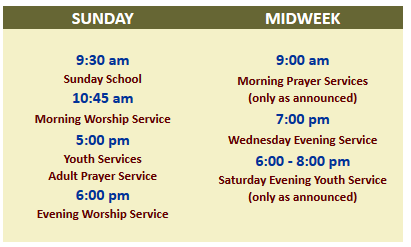 Generally speaking, Sunday services include more singing and preaching, while midweek services are often more focused on prayer, personal praise, and teaching. We sing from hymnals, and you will also notice that there are altars down front of the main assembly for the purpose of providing a convenient place for people to pray. 5) What do I wear? We want you to feel welcome, regardless of how you are dressed. As for the congregation, on Sundays most people dress up or at least wear their best. Smart casual wear is more common in the midweek services. 6) Why do people raise their hand during the singing? This is done during the singing to signify that the words of the song are a personal testimony. 7) Will you ask me for money? While an offering is taken every service, usually money is not mentioned unless a special offering is held. We believe that the work of God functions on the support of tithes and free-will offerings, and for that reason, fund-raising events are never needed. 8) Can I join your church? No, because the Word of God tells us that the CHURCH is the people, not a building. The CHURCH spoken of in the Bible consists of those who have been saved and born into the Kingdom of God. As stated on our website, salvation ALONE is the only thing that makes you a member of God's church.